Martin started the 101-lap race from an epic pole position established by the duo yesterday and skipped away to a three second lead at the end of the first lap, a position that he continued to build to almost 20 seconds at the time of their first pitstop. 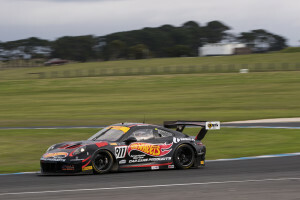 Handing over to Talbot, the Queenslander – who led the Australian GT Championship heading into the weekend – continued the momentum, pitting – out of sequence with a 40 second lead – just before the race descended into chaos. Placing Talbot in the car at the first pitstop, when most other front-running combinations left the starting driver on board for their minimum lap count, looked to be a masterstroke from the Walkinshaw GT3 squad. With the first restart, Talbot was looking comfortable at the back of the lead lap queue waiting for those in front to serve compulsory stops, until another incident at turn one triggered a further lengthy red flag stoppage. This would prove crucial. Upon the restart, Talbot pitted to hand over the Hot Wheels™ Car Care Products-backed Porsche 911 GT3-R for the short run to the chequered flag. Soon after, elation turned to despair as Martin appeared on television screens with a highly damaged #911 car. On a fresh set of Pirelli tyres, Martin had struck trouble exiting turn one, where the previous red flag had been triggered. On telemetry, the team didn’t see anything too untoward, potentially picking up on some of the dirt dragged onto the track which took him across the grass, over curbs and getting the Porsche airborne. The damage proved too much for Martin to continue on and he pulled it to the side of the circuit. Talbot is now absolutely determined to strike back at the next round of the Championship on the first weekend of August at Sydney Motorsport Park where he will be aiming to get his Championship back on track. He will use the next two months to re-group and focus the entire team at the job at hand. In addition to Hot Wheels™ Car Care Products, Liam Talbot Racing is supported in 2018 by MEGA Fuels, Hardy Brothers Jewellers, WashIt Australia Mobile Truck Wash and Urban Maintenance Systems. Australian made Hot Wheels™ Car Care Products are now available at www.hotwheelscarcare.com.au with postage free for any order over $49 and express shipping available. Commercial opportunities to stock Hot Wheels™ Car Care Products are available by contacting Terry Knight at terry.knight@hothweelscarcare.com.au. You can also follow Hot Wheels™ Car Care Products at www.facebook.com/howheelscarcare. Hot Wheels™ Car Care Products are produced under license from Mattel. “One that got away, the Island has proven elusive to us over the last couple of seasons – and it is one that we are going to crack eventually,” said Talbot. 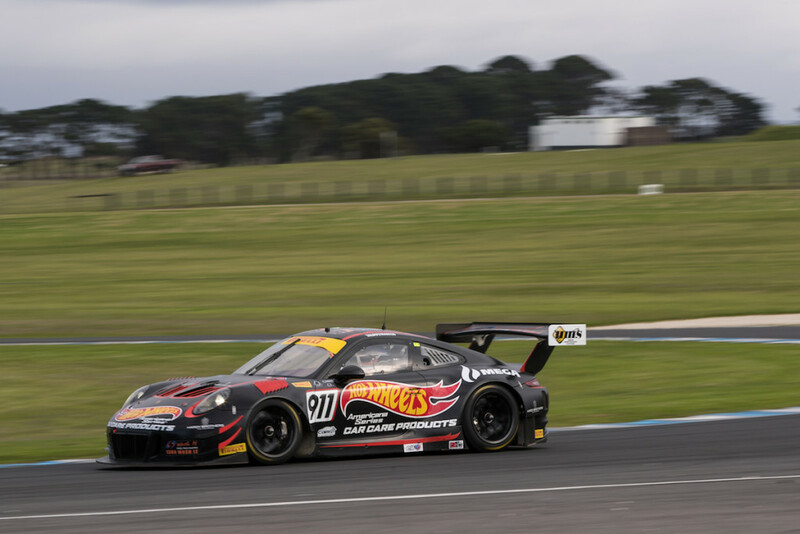 “Walkinshaw GT3 are the best in the business and showed that again today with the strategy call. The Hot Wheels™ Car Care Products Porsche was a jet and you could see that through the pole yesterday and how the race was going today. “We’re just gutted. Johnny was on fire and then in the last stint to grab some dirt or whatever happened – he doesn’t know himself – it is hard to take. “However, there is more to life than motor racing. We can put a few panels back on the car and thankfully Johnny – and indeed all the guys that had some big crashes today are OK. We’ve got a couple of months off now – we’ll regroup and put the car back together – at Sydney Motorsport Park we’re looking for something pretty special to fight back. “I don’t think we’re out of the picture from an Australian GT perspective, we don’t give up. We fight back stronger.